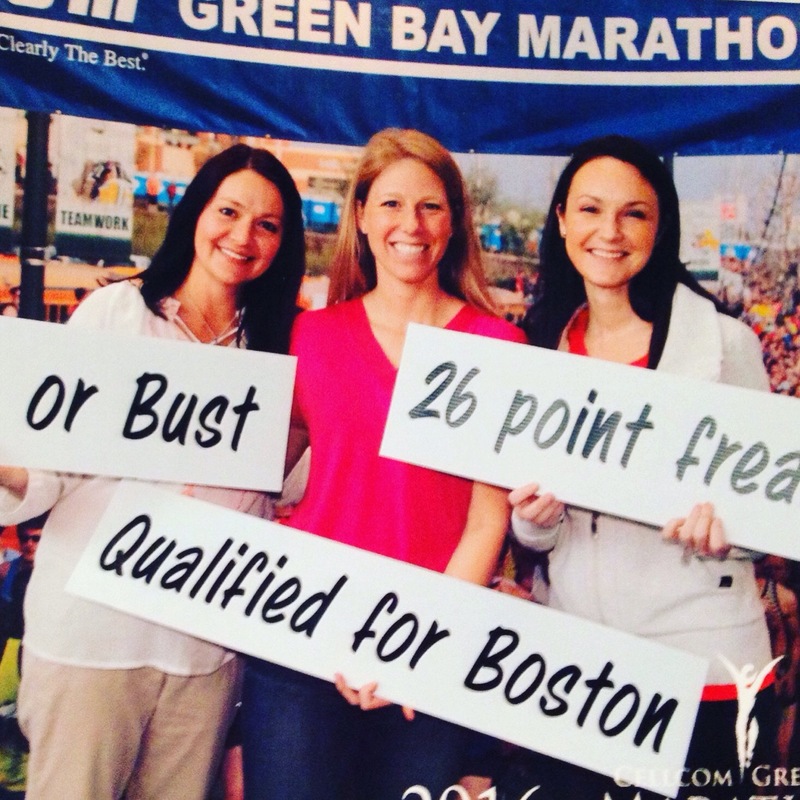 I’ve been looking forward the the Cellcom Green Bay Marathon all year! 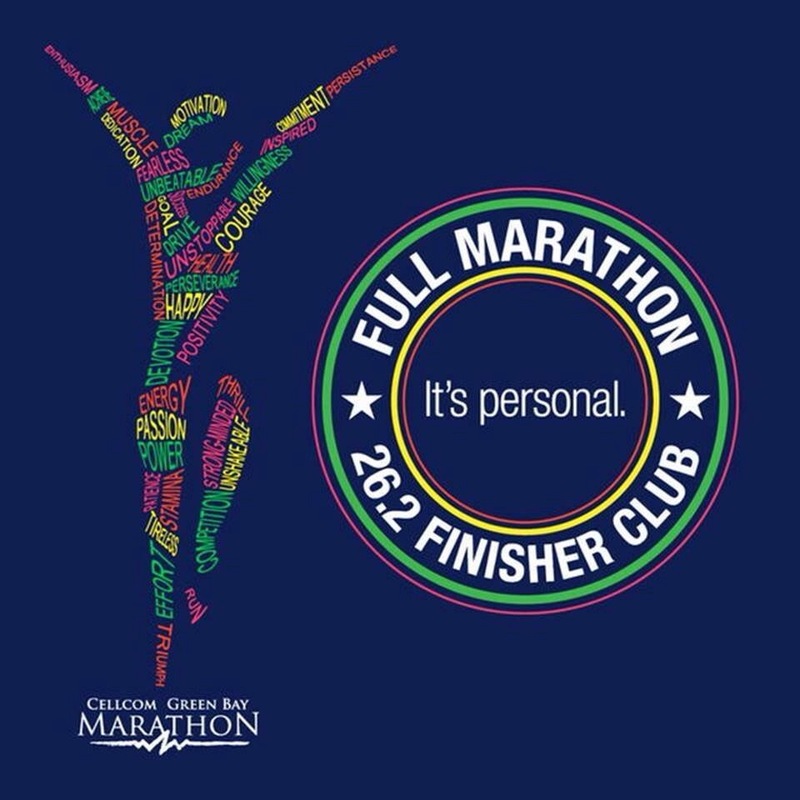 I have a soft spot in my heart for this event…it was my very 1st marathon back in 2007. 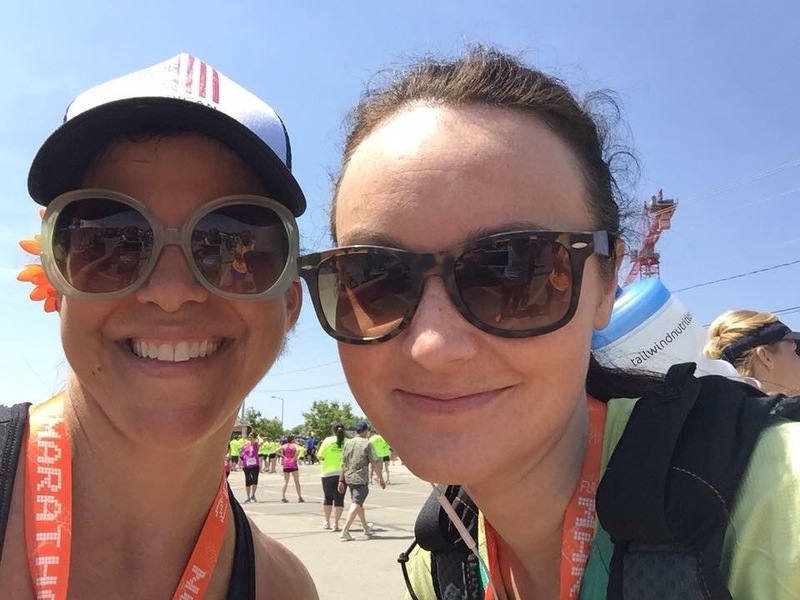 Last year I ran the 1/2 marathon and it was a disaster, it was hot and I was under trained. Fast forward a year and I was well trained and ready to take on the Frozen Tundra. Friday night I attended the race expo located at the famous Lambeau Field. This location does not disappoint. The atrium is massive with lots of space for vendors to spread out. Runners can tour the grounds, visit the Pro Shop, and grab a bite to eat in addition to picking up their race packet. The layout is designed to get runners in and out with ease. All packets are on the upper level and the vendor booths are on the bottom floor. 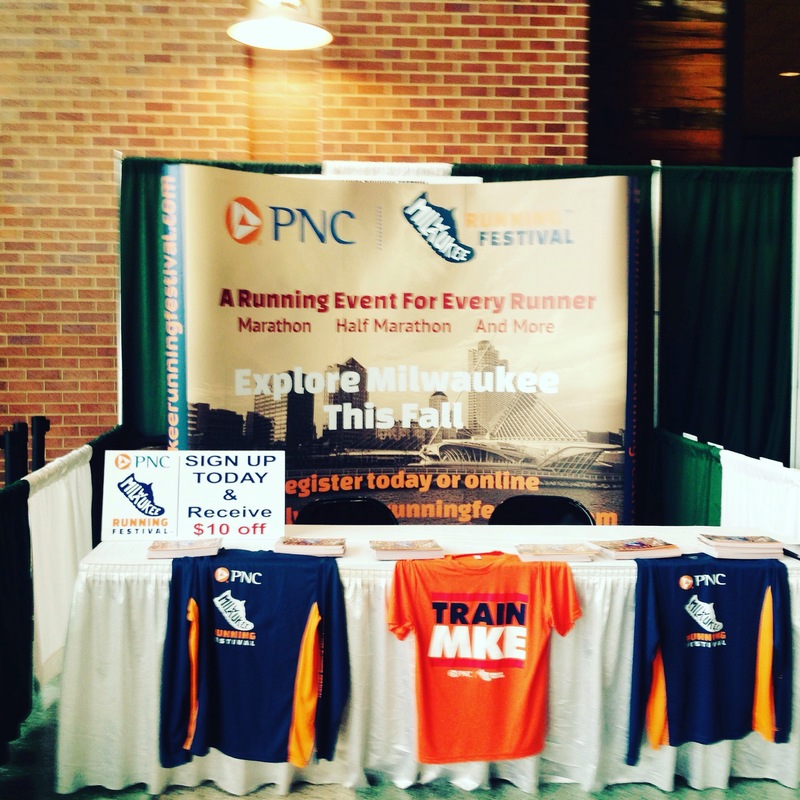 I arrived at 4pm just as the doors opened to help work the Milwaukee Running Festival booth. Event staff had set up ropes to organized runners that come to the stadium early to retrieve their bibs. Many Luv2Run coaches were there to get their youth team shirts and bibs for the Saturday 5k. I was impressed with the speed at which the waiting runners were able to get upstairs and back down to move through the expo. Within 30 minutes all those waiting had made their way to the packet area and the congestion on the lower level disappeared. I hung out at my booth for an hour chatting with fellow runners and the race director for the Milwaukee Running Festival before I headed upstairs to get my packet. The volunteers were amazing. As you arrived to the top layer of the stadium I was greeted by staff to get my bib number, I then headed into the ballroom to get my actual packet. Everyone was cheerful and friendly. The Green Bay Running Club had a booth inside the packet area making it super easy for members to renew their membership. The whole process took me 10 minutes from start to finish and I was back at my booth downstairs. Two of my good friends stopped by to visit and we all noticed that the expo was a little sparse in comparison to previous years. There were still several vendors, but the volume of booths was about 1/4 less than last year. Another change was the lack of a speaker that evening. The vibe was positive and upbeat as runners grabbed their bibs and shopped. At 7pm the expo closed down. Runners could also pick up their packets on Saturday before and after the Kid’s Run & 5k events held in the morning. I did not return on Saturday, but was told that the expo was bananas busy. Sunday posed several challenges for me: I was coming of a 50k trail race the weekend before, my Grandma’s funeral was Saturday (the day before CGBM), and I was not heat trained. I was a physical and emotion basket case. I picked up a friend from work at 5:45 am to make the 7am start on time. We chatted on our drive in which helped to ease my nerves. Cindy was also running the marathon and was nervous too. After parking a few blocks away from the start line at the stadium we walked in. The morning air was a little brisk, but quickly warmed up as the sun came out. Cindy visited the bathroom and I met up with fellow Oiselle birds running as well as my coach. 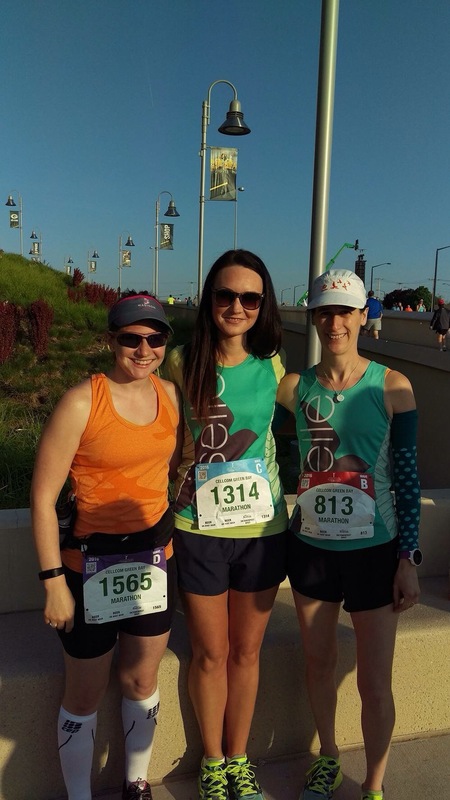 (Checkout Nora at Team Bird Training if you are looking for an awesome individual to help you reach your running goals – she ROCKS!) We caught up for a few minutes, took pictures, and got ready to head to the start. I meet up with Cindy and Katie after they got done at the bathrooms, the lines were shockingly short this year…props to the race director for increasing the number available and also staggering the start – 1/2 marathoners started at 8am. I settled into my corral. I moved up towards the 4:30 group and snuck in behind the pacers. My legs were still sore after the Ice Age and I was unsure how I would handle the miles. I knew that 4:30 was a lofty goal, but I wanted to give it a try. I knew that I could back off if it felt too fast. Before the gun went off I ran into Allison. We had met at the Icebreaker Marathon Relay in January. She had driven up from Madison with Nora and was running with a friend. We hugged and parted ways. As I waited for our corral to be released I could hear a gentleman off my shoulder talking about my hydration vest. He was making less than kind comments…to keep the story short he was telling the individual next to him I was a fool for wearing something that lead to overheating. Now everyone is different, but dude that’s a little rude if you’ve never worn this specific vest and he was talking pretty darn loud, in my opinion at a volume so others could hear. If he wanted my attention he got it, I casually turned around and looked at him with my best teacher “time to stop talking” look and turned back around. One – none of your business, two – why be rude (you for sure were not whispering) when we are about to start if this had been 9 years ago when at my 1st marathon I would have freaked out. For the record my hydration vest sits high on my shoulders and keeps my back open for air to cool it…I was darn glad I had the ability to drink as often as I needed to with the hot temps (I ended up drinking twice as much as I usually do). Again props to race crew we started on time and the corrals were moved up and out quickly. I knew within the 1st mile that today was going to be a battle. My legs felt heavy and by mile 3 the soreness became a distraction. Knock on wood to date I have never DNF’d partially because I don’t know how to…do you ask at an aid station for a ride back to the start? I’ve never taken the time to figure that part out and it is a motivator to keep going. It occurred to me after the race at mile 3 when I wanted to drop I could have just turned around and walked back to the start, it was a heck of a lot closer to reverse and add 3 miles then to take on the next 23. Oh well, I kept pushing. By mile 6 the heat started to jump up and those around me were struggling to adjust like I was. I noticed I was sweating more than usually and made a conscious effort to increase my fluids. My plan was to skip the aid stations and rely on the Tailwind I brought. I went in with a clear game plan to go out slow and stay consistent with my miles (10:00-10:30) and break for fluids/SaltStick caps every 3 miles. I wanted to stay ahead of my calves cramping, which has happened the last few races around mile 18. From mile 6 to 13 I thought about dropping out constantly. I could not shake the feeling that I was not meant to run today. 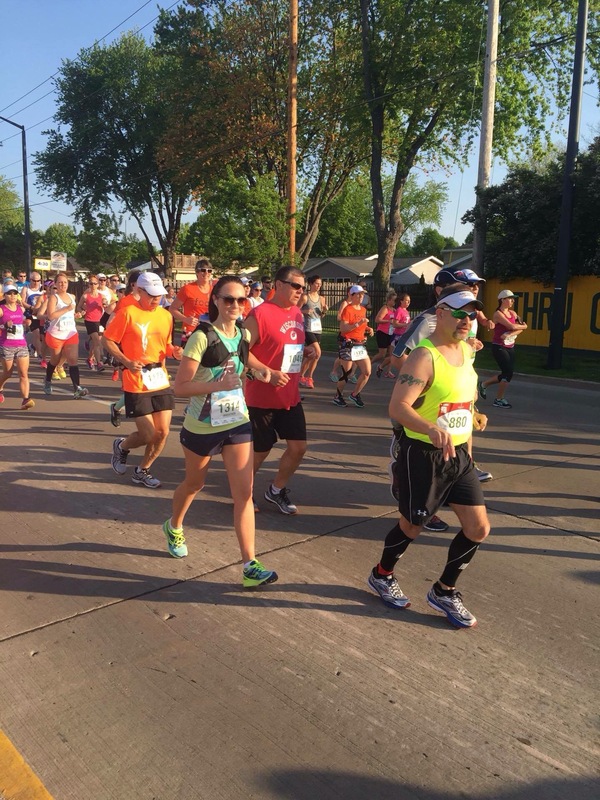 As I crossed the mat at mile 13 I cried, actually I sobbed and had to stop to catch my breath. Thank goodness I was wearing sunglasses because I am not a pretty crier. I typically try to talk myself out of this type of emotional display, but today that just wasn’t possible. I let it all out. I was able to start running again but continued to cry until mile 14. We had been snaking through the streets of Green Bay and I realized I was missing all the “good” stuff. I like to look at the houses along courses and engage with runners around me. I had been for the most part staying to myself and struggling. A gentleman pulled up next to me and asked me a question. I wish I could remember what it was, but I was in a zone (not a good one). He was able to snap me out of the pity party I was in. The Fox River Trail was a welcomed relief. I’m familiar with this part of the course from the GBRC training runs and love it for gravel shoulder off the side of the concrete path. I jumped onto the “trail” part and was able to give my legs a little relief with from asphalt. I got a few sideways looks as I ran along the shoulder of the path – not the 1st time. Cruising for a few miles dodging tree branches and spectators on the trail took my mind off my burning leg muscles and the sweltering heat. I stuck with my 3 mile and then break pattern with 1 stop at an aid station to fill my bottle. We turned off the Fox River Trail and headed towards City Stadium on the East side of Green Bay. I was beginning to fade and the thoughts of dropping again were loud in my head. My heart just was not in the race. As I slowed to a walk and again began to cry I looked up to see in the distance ahead a runner that looked like Allison. She was quite a ways up which was awesome, it was the motivation I needed to get closer to check if it was her. I picked up my pace determined to catch her. Looking back at my tracking those were some of my best miles time wise. Just before we hit the stadium I was able to get close enough to confirm it was in fact her! BONUS. After checking in we both realized that we were in a similar place both physically and mentally. Running groups are not for everyone, I totally get that, but in this moment I could not have been happier to see a fellow Oiselle bird. The support that this group of women has provided is beyond inspiring and shown me a new side of running I did not know existed. Allison was so kind. We talked, laughed, and struggled together for the next few miles. Without a doubt I would have given up and dropped if I would not have met her. I will be forever grateful for her support during marathon #18…I started the day out dedicating in my heart this race to my Grandma Lorraine and Allison helped me finish what I started. At mile 20 we were surprised by my husband and kids. The girls ran out and gave me a big hug, which was much needed before the bridge. When you are hurting in a race hills can be soul crushing and this particular bridge was going to be a battle. After saying good-bye to my family we ran to the base of the bridge and made the choice to walk up it until it crested. At this stage of the game the marathon had become mental, our bodies were shot but we were holding things together. I like to play the “leap frog” game as we used to call it in cross country. You pick a target, announce you will run to it, when you get to that target your partner decides do you keep going to different target or break. The back and forth keeps you moving and also helps to push you through the pain. 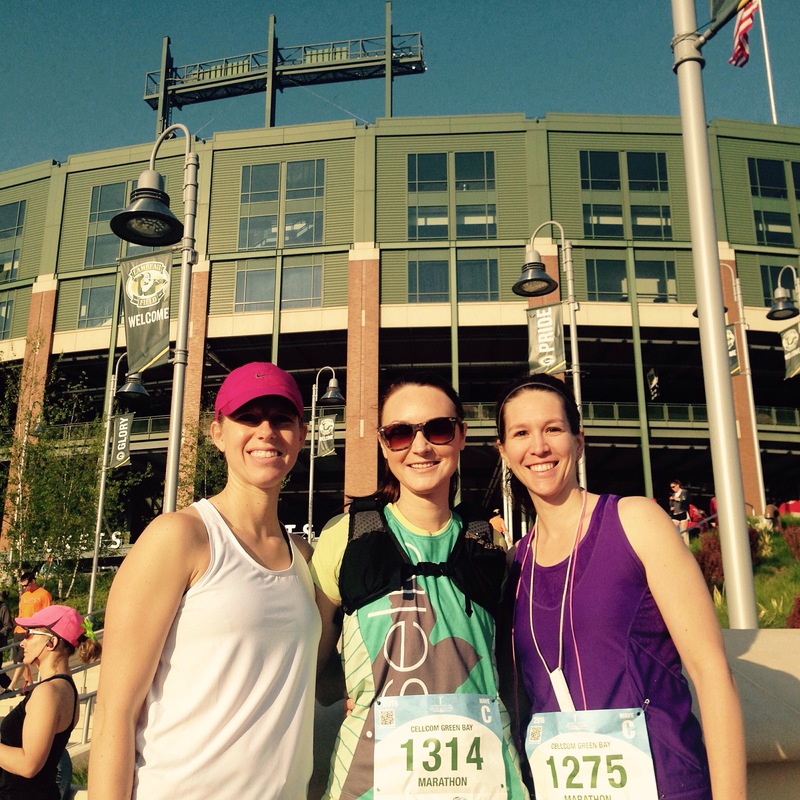 We did this for the next 5.5 miles before we hit the holy grail – Lambeau Field! I pulled out my Grandma’s picture and held it in my hand as we entered the stadium to run a lap around the field. This is an experience that will never dull no matter how many times I run through here. The crowds are loud and full of enthusiasm, it helps to propel you to the finish. We came out of the players tunnel turned our last corner and crested up the last incline to the finish. I again cried. Allison and I hugged, grabbed our metals, took a few pictures then went to find Nora. After catching up with Nora I headed for a much needed chair and chatted with the Waege clan. This ranks up there with one of the toughest days of running I have ever had, but the day was done and I finished! Time to regroup and begin to focus on my 50 mile goal in Fall. I learned a lot about myself in this race, I know I am stubborn and will not give up but for the 1st time I realized that I need people. I could not have done this alone and I took for granted all the support I have to be able to do the crazy, fun things I do. My accomplishments are not mine alone, they are the reflection of all those that inspire, challenge, guide, and love me. I am one lucky individual! On a side note – I want to recognize a VERY special person who got up at 3:45 am to make it to the start line and get all the myTeam Triumph Captains & Angels ready to fly by race start…Melissa Bennett! She truly is an amazing individual who motivates so many, including me. Orange Mud HydraQuiver VP1 – Single bottle vest allowed me to carry my own hydration/fuel mix and drink when I wanted too. I ended up drinking a total of 4 24 oz bottles. Being able to quickly unscrew the top and fill up makes this one of my favorite HydraQuiver vest to wear in a race. Tailwind Nutrition – To start I filled my bottle up at home and mixed 3 scoops of Raspberry Buzz (caffeine) with 24 oz of water. I then carried 3 single serve sticks in my hydration pack. I ended up using 1 of the sticks during the race. With the heat I felt a little nauseous so I backed off and diluted the mixture, which I felt helped. Saucony – Zealot shoes. I have found that with my arches a 4mm or zero drop is the most comfortable. Garmin Fenix 3 – I love data and with this watch you get a ton of it, plus it is stylish. Sunglasses – Cheap $7 Amazon purchase that has been a lifesaver. I don’t think I will ever run without glasses again. I could do without the weird raccoon eyes tan lines, but not squinting is worth it. Run Gum – I save my Run Gum as a reward at Mile 20…it is something to look forward to and gives me a little caffeine boost. Mint is my favorite! Once again I feel like I am right there with you. Glad you made it through this tuff one. I seem to hold my breath while reading.